Globe reporters Adam Himmelsbach and Gary Washburn will provide updates and analysis through the contest in Washington. Stevens says Amir Johnson is back in the starting lineup. Stevens on physical series: "Good basketball teams are physical. obviously there's a line that can't be crossed." 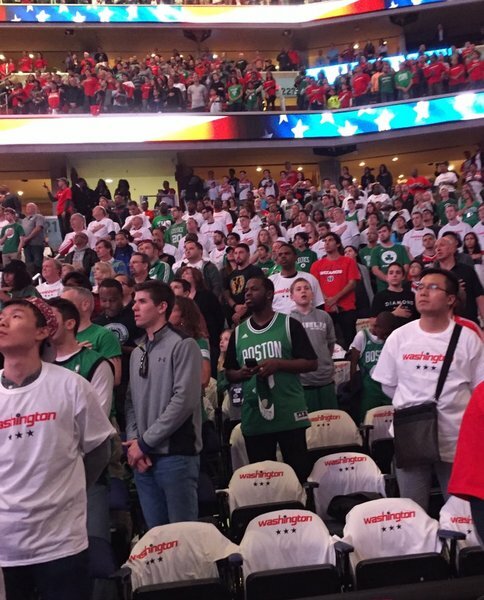 Seems like there's going to be a pretty sizable contingent of Celtics fans at the game today. WASHINGTON — Celtics coach Brad Stevens on Sunday returned to the starting lineup he used at the start of these playoffs, reinserting center Amir Johnson for forward Gerald Green. Johnson led the Celtics with 77 starts during the regular season, but he was benched for Green after top-seeded Boston lost the first two games of its opening-round series against the 8th-seeded Bulls. The Celtics went on to win the next four games in that series with Green in the starting lineup, and Green remained there during the team’s Game 1 win against the Wizards in the Eastern Conference semifinals. Even though Boston won that game, the Celtics were outscored 16-0 at the start of the game, so in Game 2 Stevens returned to Johnson. The team had a slow start then, too, falling behind 16-8. And in Game 3, Green got the call once more. The score was tied at 12 early, but later in the first quarter Washington blitzed the Celtics with a 22-0 run and rolled to an easy win. Over the first three games of this series, the Celtics were outscored 119-70 in the first quarter. Before Game 4 on Sunday, Stevens said that he had analyzed all of the starting lineups in the Celtics’ seven games against the Wizards this season. He determined that the start of Game 2 with Johnson was not as ugly as it had originally seemed. And he realized the Celtics’ 110-102 win over Washington on March 20 was the only other game in which Boston had used its regular starting lineup, and the group had played quite well together. Johnson averaged 7.5 points and 5.7 rebounds per game during the regular season. But over the first three games of this series he had a total of just three points and four rebounds. Of note: If the Celtics/Wizards series ends in six games or less, the winner will face the Cavaliers in Game 1 of the conference finals on May 15. If this series goes seven games, the conference finals would not start until May 17. Every game of the conference finals will start at 8:30 p.m. and be televised by TNT. #Celtics already down 8-0 just 2:41 into the game. Some fans chanting "free Oubre"
A healthy round of cheering from Celtics fans after each of Isaiah Thomas's 3-pointers. Boston has made two of its three 3-points attempts; Washington hasn't sunk a 3-pointer yet, 0 for 2. Marcus Smart the Celtics' first sub, in for Amir Johnson. Isaiah with a hot shooting start, now 3 for 3 from three and had a hand in his face on two of them. Wonder what Rozier and Jennings are talking about. Wizards had three first-quarter turnovers over the first three games combined, but they had five in the first quarter today. 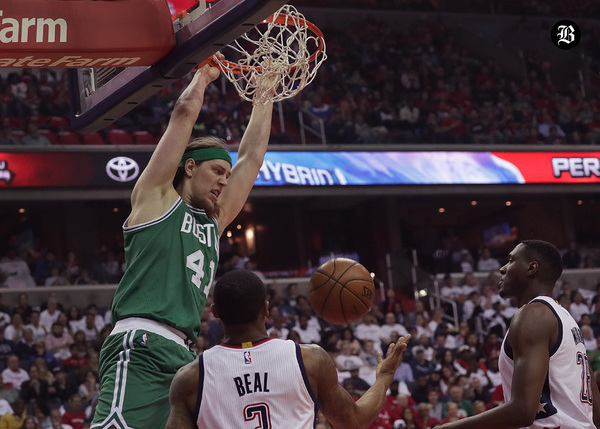 #Celtics lead #Wizards 24-20 after 1Q, trailed 8-0. Thomas 9. Crowder 4 and 5 rebs; Porter 10, Breal 6, Morris 4. Shooting: Celtics 42.9% (18 of 42); Wiz 42.2% (19 of 45). 3s: Cs 44.4% (8 of 18); Wiz 30.8% (4 of 13). Fast-break points: Celtics 5, Wizards 9. Points in the paint: Celtics 18, Wizards 20. Bench points: Celtics 11, Wizards 5. Second-chance points: Celtics 8, Wizards 11. #Celtics a mess offensively right now. 11-0 run by the #Wizards and they by 6. #Celtics can't get a defensive rebound. Isaiah is 5 for 6 from three but hasn't gotten free to attempt one since the 8:00 mark of the second quarter. Porter with the steal and dunk and it's a 15-0 Wizards run. Wow, what an onslaught by the Wizards. Now a 22-0 run and they're getting whatever they want in transition. 22-0 run for the #Wizards . #Celtics haven't scored since the 11:10 mark. 26-0 run. #Wizards up 74-53. Total #Wizards run is 46-13. Six turnovers in the 3Q for the #Celtics . 6 in the first half. Celtics have 8 turnovers during this Wizards 26-0 run. #Wizards scored those 26 points in 5:41. That's hard to do. 62-36 #Wizards since the 1Q. Now a loud "Kel-ly Ou-bre" chant. 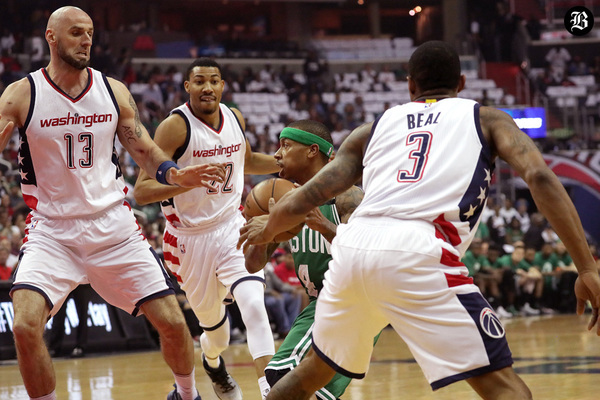 Wizards have outscored the Celtics 204-152 in DC so far.